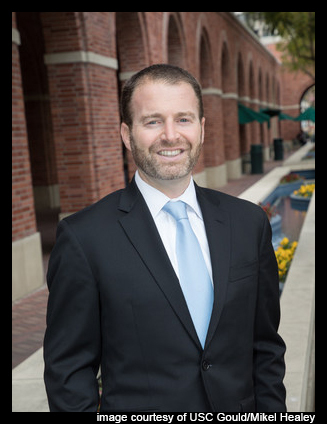 Danny Guggenheim (Partner – Pircher, Nichols & Meeks LLP) has been appointed as a Lecturer in Law at the USC Gould School of Law (USC Gould) to co-teach the Real Estate Law and Business course in the fall 2018 semester with Professor George Lefcoe. Mr. Guggenheim is a USC Gould alumnus, and Professor Lefcoe holds the Ervin and Florine Yoder Chair in Real Estate Law at USC Gould. The Real Estate Law and Business course has been taught by Professor Lefcoe for several decades and is renowned for a syllabus filled with guest lectures and site visits involving prominent real estate professionals. "It is a tremendous honor to have been asked by Professor Lefcoe to join him at the helm of his Real Estate Law and Business course this fall," says Mr. Guggenheim. "His upcoming retirement represents the end of an era for several generations of USC Gould alumni in the real estate industry, many of whom got their first taste of the business in his class and have returned to campus with great pride to serve as guest lecturers - myself included. I am humbled to be a part of his last semester teaching at USC Gould." Mr. Guggenheim received his B.A. in 2000 from Columbia University and his J.D. in 2004 from USC Gould. He dedicates the bulk of his law practice to the representation of private equity funds, real estate companies, non-bank lenders and other investors in connection with commercial real estate joint ventures, financings, acquisitions and dispositions.